Disclosure- I will receive a copy of the below for promoting. All opinions are my own. See I Disclose for more info. Have you seen the latest LEGO movie? It was really fun (and at times, very funny). Your kids will love it- and honestly, so will dad. LEGO Justice League vs. Bizarro League is out now, and is worth a watch. Lego fans wait no more- LEGO: DC Comics Super Heroes: Justice League vs. Bizarro League is here along with an awesome Bizarro name-generator app and exclusive Digital Trading Cards. 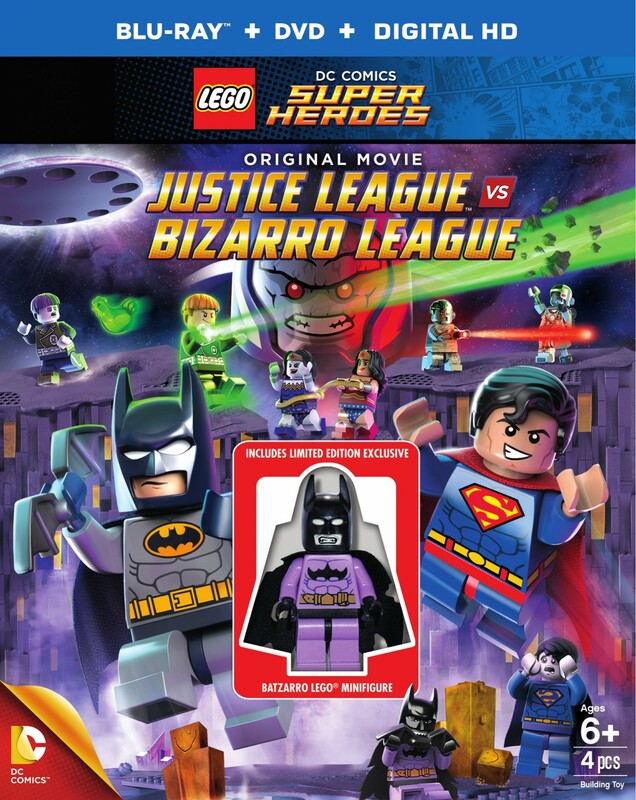 One winner will be able to win a Blu-ray+DVD+Digital HD UltraViolet Combo Pack + with Batzarro LEGO minifigure of LEGO Justice League vs. Bizarro League. Please feel free to use the RC form below to enter to win. I would give it to our nephew. I’d give it to my little girl, she loves all the Lego shows! give it my son of course!!! I would give this to my son and daughter. I would give this to my grandson if I win. I know he would really enjoy it. I would give this to my two little ones! Thanks for the chance to win! I would give this to my son if I won. He loves Legos and super heroes. I would give the DVD to my two youngest grandchildren. This would be a gift for my 2 kids. I would give this to my 7yr old daughter, she just loves legos. I would give the DVD to my son. I’d love to win this for my kids. They love everything LEGOs. I would give this to my grandchild. My cousin! Thanks for the chance to win! this will no doubt go to my son if i win! I would give this to my son he would love it and I am always up for a movie night with him! would give to my nephew! I would give this to my daughter! Thanks for the great giveaways! I would give this DVD to my 3 children , I think all 3 of them would enjoy it, but especially my 2 boys! I would give this to my son. He would enjoy it! I would like to win this to give to my grandson. Lego’s are his favorite! I’d give this to my sons. They are HUGE Lego fans! I’ll be sharing this movie with my grandchildren. This DVD will be given to my son. Thank you for the giveaway! I’d give the DVD to my son 🙂 He would love it! I’d give the dvd to my nephews. I will give it to my 8 year old son. I will keep it here when my grandchildren who are 4 and twin babies come over. I would give this dvd to my kids. My grandson would enjoy this DVD. I would give this dvd to my nephew if I won it. Thanks for the giveaway. My two boys they are obsessed with Legos. This is too cool to share, I want this for myself. This would be an easter present to my 3 boys! I would give this to my daughter, she loves legos!